~ Three Drops in the Cauldron has just published one of my poems in their Winter issue. ~ My poem, Maria Elena in Brooklyn has been published by NatureWriting. 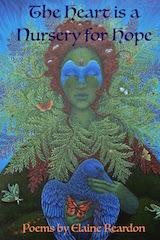 ~ Poppy Road Review is publishing some of my poems, including The Healer. ~ My poem, Cape Anne Earthquake, is a Poem of the Moment at MassPoetry.org! ~ My poem, The Coming Time, will be the featured post at the literary ezine Stanzaic Stylings, edited by Joanne Oliverie. It will be published January first, to start off the new year.